THE CASE FOR PUTTING PEOPLE BEFORE NATURE | "Global Possibilities"
Third in a series on tackling poverty while protecting the environment. Read the intro. There was only one problem with this plan, and it was a really big one: Nobody had thought through the economics. José Martinez-Reyes, Moral Ecology of a Forest. It’s a typical problem. When conservationists set out to protect environmental resources in poor countries — the trees of Haiti, say, or the wildebeest on Botswana’s savanna — they often confront a basic concern: People live off those resources. Trees can be sold as charcoal; wildebeest tastes just dandy when food is short. No one will ever make their children go hungry to save the environment. Without some change in the underlying economic conditions, as soon as the environmentalists leave, the local people go back to making charcoal or hunting wildebeest. And so, nonprofits dedicated to protecting animals and ecosystems have started focusing on people — building health clinics, sponsoring business development, or advocating for payments to rural communities — in order to protect natural areas. Craig Leisher, a senior scientist at the Nature Conservancy, noticed such a profound shift in thinking that a few years ago he checked to see if there had been a corresponding shift in the way nonprofits described themselves. “More than half the large-scale conservation NGOs changed their mission statement to specifically include people,” Leisher said. Pretty much every environmental group acknowledges the importance of improving the lives of people in the areas they want to protect, but there’s a fundamental split over how to do this. Is the goal to have people stay in natural areas, or move elsewhere? 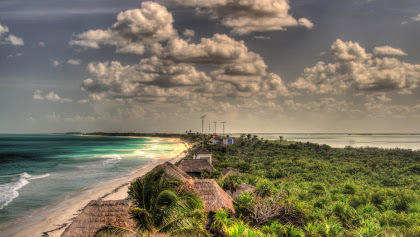 All over the world, environmental groups are trying to figure out how to balance nature and people in carbon-rich biodiversity hotspots like Sian Ka’an. And this is tricky. It’s really freaking hard to find ways for people to live and make money without affecting the environment in some way. These projects seeking to help people and conserve ecosystems exist on a spectrum: Some prioritize incomes, while others prioritize the environment. The right balance probably depends on context. But the case of the Tres Reyes butterfly project suggests that you can’t tilt all the way toward the protection of environment and also expect an economic windfall. Anthropologist José Martinez-Reyes has spent more than a decade studying the situation in Tres Reyes. He tells the story of how environmental groups attempted to build sustainable businesses there in his new book, Moral Ecology of a Forest. In 2000, a nonprofit called Amigos de Sian Ka’a launched a plan for villagers to trap and sell parrots as pets, but that was torpedoed three years later when the government outlawed the practice. There were many attempts to start ecotourism businesses, but the locals couldn’t compete with rival ecotourism outfits from Cancún and Tulum. Project leaders instructed women of the village to catch butterflies with hand nets to determine which species were most abundant. But this was strictly a catch-and-release operation, for research purposes. The community wasn’t supposed to kill even the most plentiful butterflies. Instead, the women would walk along the highway searching for butterfly roadkill, which they would collect in plastic bottles. Afterward, they would spend hours in the village church, crafting butterfly-wing sculptures. But it was unclear where they would sell their works of art, or who would buy them. It hadn’t. The nonprofit and the government bureaucracy had insisted on scrupulous proof that the community was doing absolutely no harm to the environment with its new business ventures, and all those official hoops — paperwork, and delays while waiting for approvals — made it impossible to turn a profit. The butterfly project was great for the goals of environmentalists — the conservationists wanted members of the community to live lightly on the land and devote themselves to monitoring plants and animals — but it utterly neglected the goals of the community. In an email, José Palacios, director of U Yool Ché, suggested that strict environmental regulations forced the nonprofit down this route. Sebastian Proust, a coordinator for the Nature Conservancy in the Yucatan, vouched for U Yool Ché, noting that the butterfly project happened nearly 15 years ago. When the United Nations funders of the project brought it up for review in the spring of 2002, a biologist on an evaluation panel was outraged that the women were using butterflies, and the panel declined to extend funding. Picking up dead butterflies was just too environmentally intrusive. The “leave no trace” wilderness ethic is great for middle-class backpackers in a national park, but that ethic just doesn’t work for people who depend on the land for their sustenance. Fighting poverty is hard enough on its own. It’s virtually impossible if we stipulate that the process must leave no mark on the environment. For the people of Tres Reyes, these failures are infuriating: Time and again, the community members sat through endless meetings and training sessions. Time and again, they devoted days of unpaid labor laying the groundwork. “The guaches (outsiders) come with projects, but we never see the benefits,” one community member told Martinez-Reyes. Nature for nature’s sake, or nature for people? The people of Tres Reyes aren’t alone: An effort to get Ugandans to harvest coffee that grew wild in the forests failed when organizers found they couldn’t get a high enough price for the beans to justify the time it took to collect ripe berries. When the ice cream company Ben and Jerry’s started buying wild-harvested Brazil nuts from indigenous people in the Amazon, it scored a runaway success with its Rainforest Crunch flavor. But it didn’t slow deforestation because it didn’t change the incentives of the ranchers burning down the forest. After a scandal over labor exploitation, Ben and Jerry’s discontinued the flavor. The failures don’t mean that it’s impossible to do conservation and economic development at the same time. They just suggest that changing things requires compromise. Whenever people are present, that ecosystem is going to have a different character than when people are mostly absent. People tend to protect their livestock and children by killing top predators, creating all sorts of trickle-down effects. And when those people work for the benefits of modern life — education, health care, washing machines — it tends to change the character of the ecosystem even more. As the conservation world debates this, two camps have emerged: mixers and splitters. “The question is: Is human activity compatible with conservation?” Linus Blomqvist, director of conservation at the Breakthrough Institute, said. Leisher’s colleague at the Nature Conservancy, Peter Kaviera, is often identified as a standard bearer for mixers. Biologists E.O. Wilson and Michael Soulé, though, say no. They are dividers. They’d like to see large areas of the earth preserved without people — Wilson wants to devote half the Earth’s surface to nature. This debate is ferocious — Wilson and Soulé called Kaviera “wrongheaded, counterproductive, and ethically dubious” — but both sides agree that conservation will fail unless it finds a way to take care of people. Wilson’s poverty solution is to have people move to cities, intensify farming, and innovate like crazy to shrink the human footprint. Martinez-Reyes sides with the mixers — he’d just like to see it done well. The strategy of moving away from the land hasn’t worked well for the people of Yucatan, he told me. Environmentalists have been buying land from the villagers for conservation — a splitter strategy. But the money the people get for the land doesn’t reflect its value to them, he said. The people Martinez-Reyes knew who sold out and moved into towns had to pay for rent and food for the first time in their lives. Their money ran out fast, and they ended up much worse off than before, he said. Perhaps the most interesting thing about this debate is that all sides agree that alleviating poverty is what makes conservation possible. When people don’t have to struggle for survival — when they have adequate healthcare and the opportunity to get a good education — they can take care of the environment. Splitters would accomplish this by having people consolidate into cities, while radically increasing protected areas for wilderness. Mixers aren’t against urbanization, but they think that markets will also have to grow in rural areas, to meet poor people where they are. That’s a big shift. In the past, a lot of environmental work has focused on stopping things: Halting the bulldozers, blocking the harpoons, choking off the smokestacks. That can be important work. Stopping things, however, isn’t enough. Stopping change can only maintain the status quo and the status quo — poverty, environmental catastrophe — is unacceptable. But the shift from building things and proposing solutions can feel foreign to people who have been mostly stopping things. Even good solutions can have faults — often, in unexpected ways, they hurt the environment or disrupt cultures. Conservation groups have mostly accepted that they needs to go beyond preservation, but sometimes — as with the butterfly project — they are so cautious about changing things, that they fail to change anything.